If you are running a big business and think that offline marketing would be enough to attract customers, you might be wrong. You need to realize right now that everything on this globe has gone mobile. Even the street food corner in your locality has a Facebook page and maybe having more followers than your business. So, if you are running a company whether big or small, it is necessary that you should have a mobile friendly and a responsive website. There is no doubt behind that smartphones are overruling the tech world for performing all tasks and if you still think that your offline marketing is enough to have a good customer base then it is the time to think over it again. 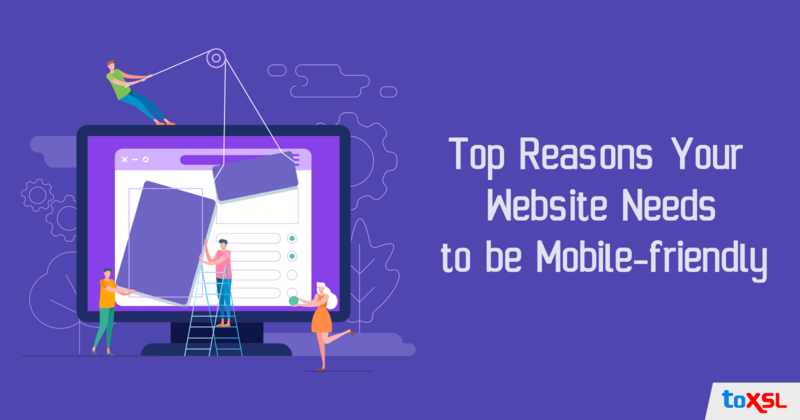 Here we have mentioned some of the key points of why you should opt for a mobile-friendly and responsive website for your business and how it will benefit you? Find the answer to all your queries and make smart decision to define your business growth and success. Here are the top reasons why you need to have a mobile-friendly website for your business. A rise in the number of mobile users: Since smartphones are handy and have replaced laptops and PCs, people nowadays hardly bother to sit in front of their desktop to search and view your website. They use their handy mobile phones to search and get to know about your business. This has increased the demand of creating a responsive website which offers a seamless view of all devices. SEO efforts: You must be aware that responsive websites have a better chance of getting top rank on by Google. In order to gain the trust and faith of customers, you must have responsive websites and attain more and more customers. Low Maintenance Cost: The top advantage of using responsive website is that it demands no maintenance at all as compared to other versions of the website. Responsive websites come up as a one-time investment and without any hassle of maintenance and other costs. Once you have paid for a responsive website, its done on your part. Getting one single website for desktop and mobile offers you more time to focus on other areas. Finest user experience: Since customer experience is the primary thing to grow your business and should not be compromised at any cost. Therefore, it is good to get a responsive website design that offers a great user experience without any interruptions and delays. This helps you in targetting more potential customer and in offering complete satisfaction to them. Without any second thoughts, you must hurry up to get a responsive website and attain a strong customer base. So, if you are planning to get a responsive website for your business, you can rely on us. ToXSL Technologies is one of the trustworthy companies which offers the best responsive design services at the best affordable prices. Can't believe? Get in touch with us and try our exciting services. We have the perfect plans for your website and business!